In the EU, if a Member of the Parliament presses the wrong button on a vote, they can have the record amended to show what their true intention was, but the vote is binding. Today, the European Parliament voted to pass the whole Copyright Directive without a debate on Articles 11 and 13 by a margin of five votes. 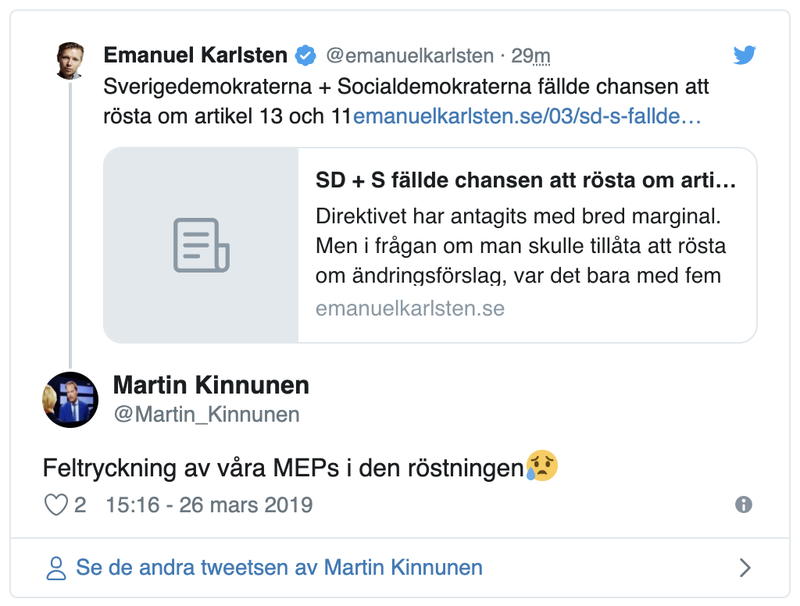 But actually, a group of Swedish MEPs have revealed that they pressed the wrong button, and have asked to have the record corrected. They have issued a statement saying they'd intended to open a debate on amendments to the Directive so they could help vote down Articles 11 and 13. We lost on a technicality, and there is no recourse. And it's because someone pushed the wrong button. It's the Edward Tufte apocalypse. It'd be funny, if it didn't make me want to smash my laptop.